The Responsible Service of Alcohol is one of Harbord Bowling clubs most important responsibilities. All of the Group’s front of house staff has been trained in RSA, which aims to minimise negative social impact of alcohol consumption and ensure alcohol is enjoyed responsibly. Harbord Bowling club is committed to the responsible service of gaming. The club is instrumental in setting up BetSafe, an expert consultancy service to combat problem gambling. BetSafe provides areas of education and counselling that have proved invaluable in the process of harm minimisation on which the club has embarked. Is gambling a problem for you? G-Line (NSW) is a confidential, anonymous and free counselling service. Free call 1800 858 858. Members may obtain a player activity statement that shows their spending on gaming machines over a monthly period through the club kiosks. Harbord Bowling club operates an electronic sign-in system. 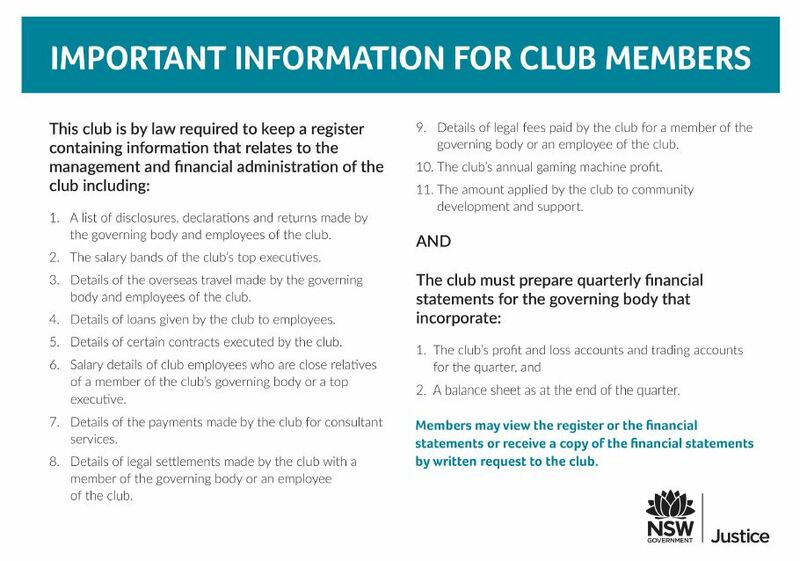 The primary use of data collected to conform to the requirements of the Registered Clubs Act 1976. How is the legislation enforced? Environmental Health Officers based in NSW Public Health Units are authorised as inspectors to enforce the legislation. Environmental Health Officers monitor compliance, investigate complaints and conduct inspections. Individuals have the responsibility to not smoke in smoke-free areas. How do I report a possible breach? Individuals are encouraged, in the first instance, to take up complaints about non-compliance with the legislation at Harbord Bowling club directly with management. Alternatively, individuals can contact their local Public Health Unit or the Tobacco and Health Information Line on (02) 9391 9111 or email tobacco@doh.health.nsw.gov.au to obtain more information or to make a complaint. Rules and conditions of competitions and promotions held at Harbord Bowling club are available on request.